The back cover to this, Dave O'Higgins nineteenth album as leader, should be a clue as to its contents. A pastiche of the informative reverse sides of all those fantastic Blue Note albums correctly suggests that this is an album which contains at least some hard bop. This is certainly true of the opening title track and its successor, "The Adventures Of Little Peepsie." Things then move on with a more Latin-esque feel, albeit a very Chick Corea one, on "Alien With Extraordinary Ability." 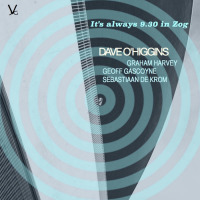 "Nothing To Lose" is back to the bop; a little more mainstream this time, O'Higgins' confident tenor is both swinging and relaxed. The sultry bossa nova, "Brixton," signifies a definite change of tempo and benefits from a haunting melody, followed by the frenetic "Timelessness." The chirpy "One For Big G," here with O'Higgins on soaring soprano, contrasts with the bluesy tenor-rich "New Resolution," which boasts a sneakily memorable vamp. "Autumn Serenade" is almost redolent of the evergreen "Summertime," with a majestic head described by O'Higgins's sumptuous tenor. The set concludes with the ruminative slow ballad "Easy Living," affording an opportunity for O'Higgins to display his luxuriant tenor style. Whilst the dozen tracks represented here can hardly be described as iconoclastic (nor were they intended to be), they are skilfully crafted and executed with consistent aplomb. The very high caliber of this quartet would inevitably entice the listener to hear this group live and in the flesh, and they will therefore be gratified to learn that O'Higgins is embarking on a major multi-venue UK-wide tour in the latter quarter of 2017. As for the space-themed quirkiness of the title, the album's content is actually nearer to "Solar" than Sun Ra...but that's certainly no bad thing. Track Listing: It's Always 9.30 In Zog; The Adventures Of Little Peepsie; Alien With Extraordinary Ability; Nothing To Lose; Brixton; Timelessness; Morpheus ; One For Big G; New Resolution; Humble Origins; Autumn Serenade; Easy Living. 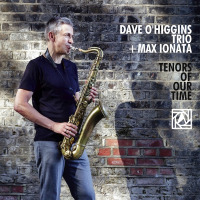 Personnel: Dave O'Higgins: tenor and soprano saxophones; Geoff Gascoyne: bass; Graham Harvey: piano; Sebastiaan de Krom: drums.